Hello Aspirants, looking for Indian army recruitment we have a good news for you as Indian army soon will be announcing Applications for Candidates can apply for 19th Short Service Commission (Technical). 19th Short Service Commission (Tech) Women Course (JAN 2017) (INCLUDING WIDOWS OF DEFENCE PERSONNEL FOR NON-TECH ENTRY) (commencing at Officers Training Academy (OTA), Chennai for commission in the Indian Army in all Arms/Services. Interested and Eligible candidates can apply online by reading article from the official website of Indian army on or before 2016. Feel free to ask below in comments regarding SSC Tech Women Entry. Age Limit : – (i) SSC(Tech)-19 Women :-20 to 27 years at the time of commencement of course. hi,i have been going through the online link mentioned above for a month(june 2016-july 2016) but there has been no mention of application forms of ssc technical female or male on the site. what should i do? 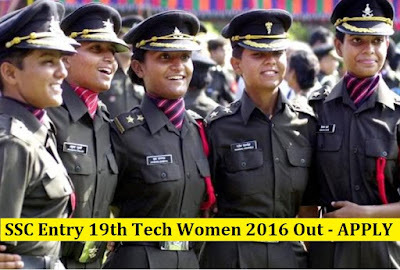 Why indian army dont have vacancies in Computer Science Department for women? ?